The blackness swallowed us as we descended down into the earth. We carried lights, but the darkness encroached on us from all sides. The gentle scuffling of feet on the gravel, an occasional soft trickle of water in the abyss and our own breathing were the only sounds. These are the Sterkfontein Caves inside the Cradle of Humankind. 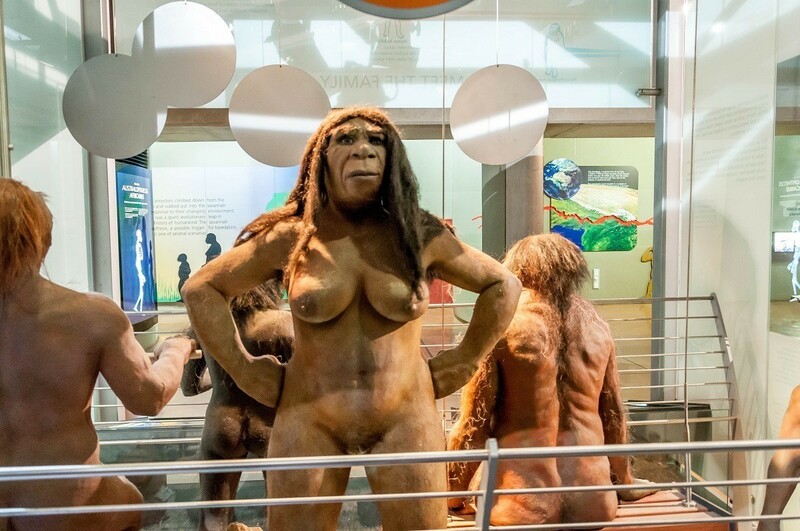 The Cradle of Humankind is a large complex of caves, valleys and rivers that have produced some of the oldest and most informative hominid (ape-man or human ancestral) fossils in the world. The Sterkfontein alone has produced more than third of all the hominid fossils ever discovered in the world. 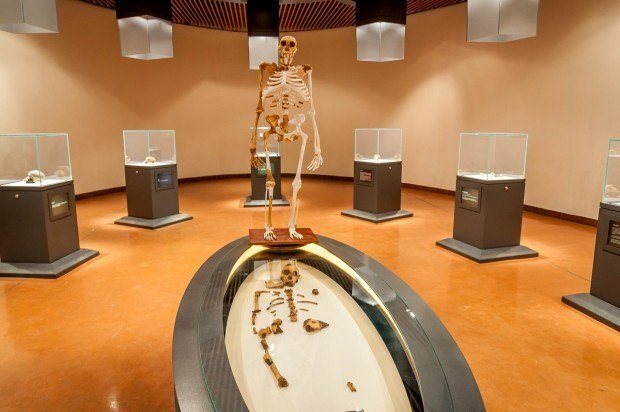 The Cradle of Humankind is anchored by the Sterkfontein Caves and the Maropeng Visitors Center. Located just outside of Johannesburg, it made for an easy trip from the airport after landing during our big South Africa trip. I’m always interested in UNESCO World Heritage Sites and this one seemed like a great fit, especially with my background in biology. At least that’s how it seemed to me while doing my research. 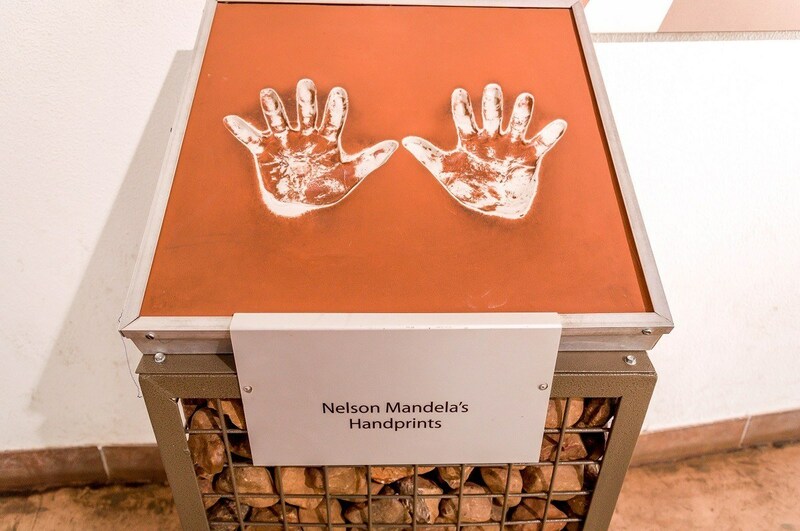 Most visitors start their experience at the Maropeng Visitors Center. 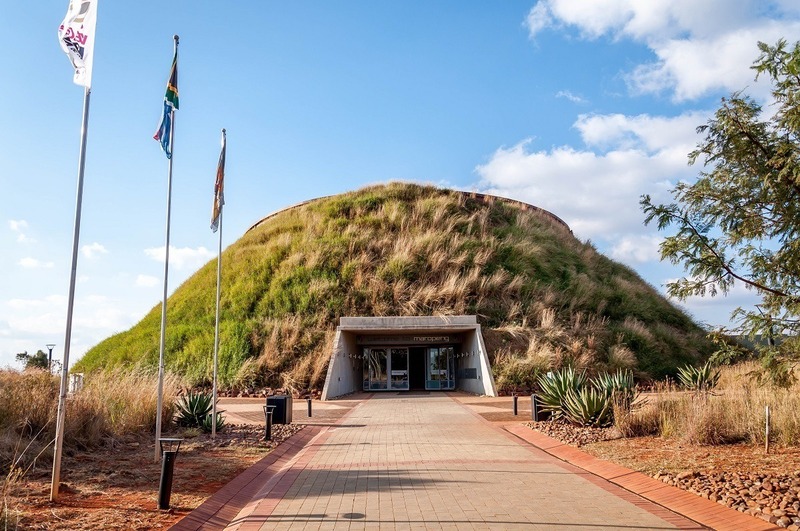 A conical, grass-roofed building, the Maropeng Visitors Center provides context for human evolution through a number of informative exhibits. The exhibit beings with an EPCOT-like boat ride, that shows the four elements. In the main exhibit halls, you can see information about the discoveries of the “Taung Child” skull in 1924 as well as the “Mrs. Ples” skeleton found in 1947. There are also numerous other hands-on exhibits that are designed to provide hands-on learning about evolution for children. 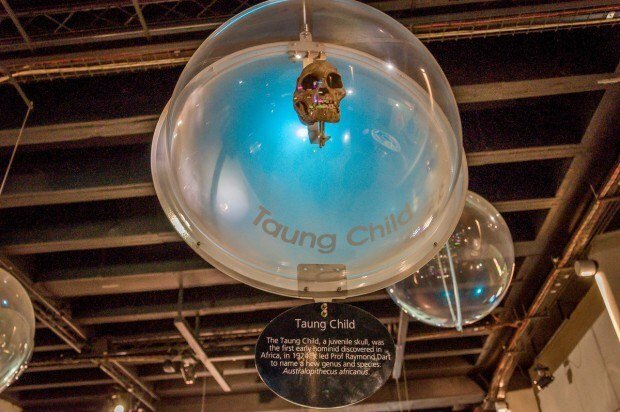 The Maropeng is a hit with children and families! 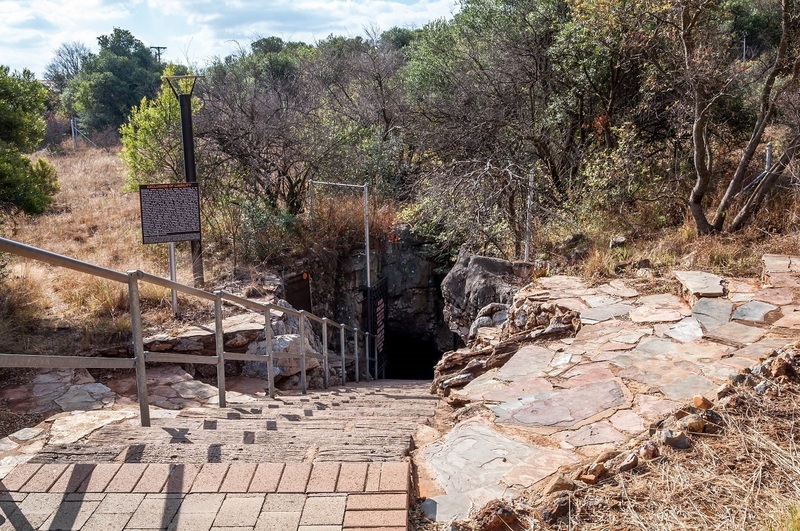 From the Maropeng Visitors Center, guests strike out to the Sterkfontein Caves for a more authentic experience. Here we picked up our hair nets and hard hats before descending down several hundred steps into the darkness. This cave is where the remains of “Little Foot” were discovered – probably the most intact hominid or human ancestral skeleton ever found. It is still being excavated to this day. 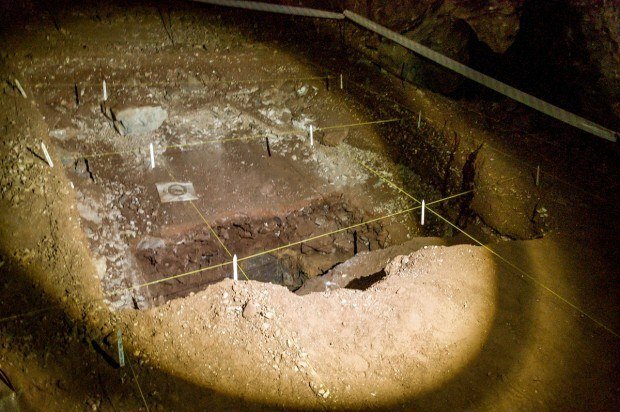 In other places in the cave, you can see where other archaeological digs are taking place. The Sterkfontein Caves and the entire Cradle of Humankind site are a window into what our human ancestors from the Pleistocene era were really like. As I said, I was biology student and I completely geeked out on this. 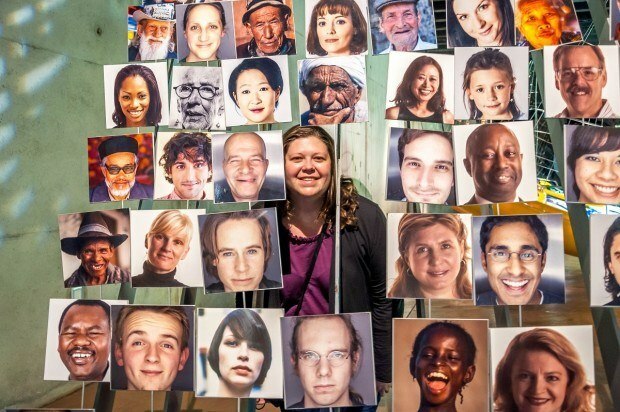 However, even more insightful than the biological evolution is the cultural one. The Cradle of Humankind caves are where we have the first evidence of human ancestral domestication of fire over a million years ago. Like I said, I geek out on this. So, what’s not to love about the Cradle of Humankind? The region of the Cradle of Humankind outside of Johannesburg is very beautiful, but there’s not a lot to see. This area is important to documenting human evolution (both biologically as well as culturally); however, most of that research takes place behind the scenes. Other than going inside the Sterkfontein Caves or the Maropeng Visitors Center, there’s not much happening for the casual visitor to observe. 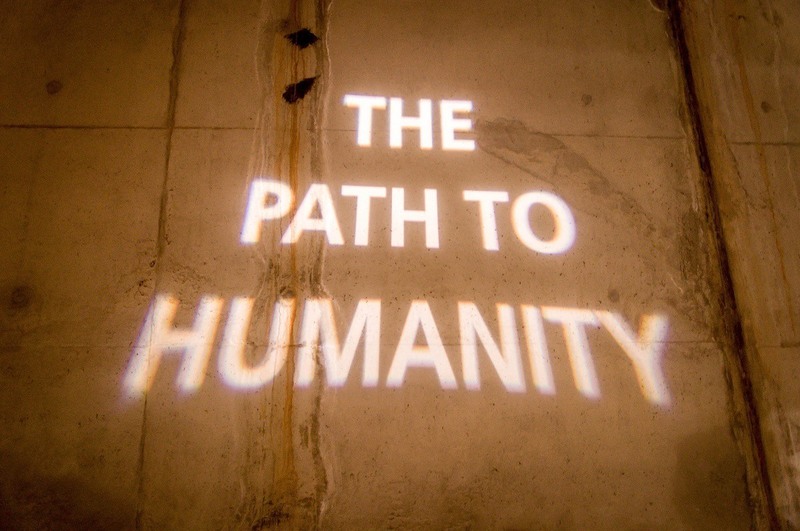 Am I glad I visited the Cradle of Humankind? Absolutely. Would I do it again? Probably not. The Cradle of Humankind is about 51 kilometers (31 miles) from downtown Johannesburg. It’s about 95 kilometers (60 miles) from the O.R. Tambo International Airport. The Cradle of Humankind sits right on the border between Gauteng Province and North West Province. While the location is not remote, it is not developed. Public buses are very infrequent and are relegated to only the major roadways. 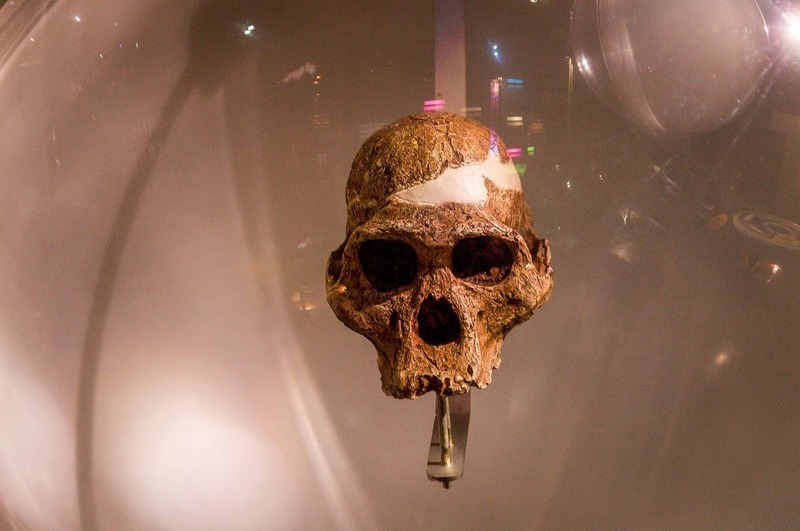 To visit the Cradle of Humankind, you have two options: book one of the Cradle of Humankind tours (see below) or rent a car and experience the Cradle on a self-drive tour. Cradle of Humankind tours are offered by several different companies. 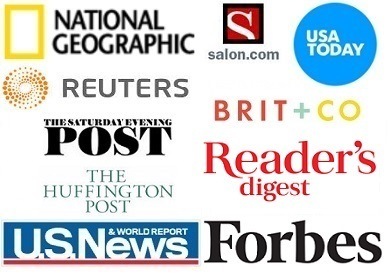 Click here to see a section of both group and private tours. 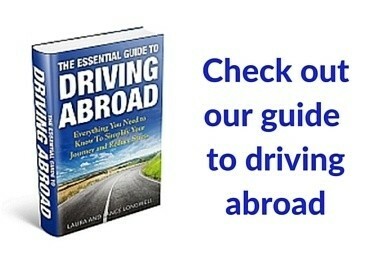 If you opt to rent a car and drive yourself, we recommend checking out the comparison tool at Auto Europe. Yes, they rent in South Africa too. The Maropeng Visitor Center is open daily from 9:00am – 5:00pm. Please note the last boat tour is at 4:00pm. 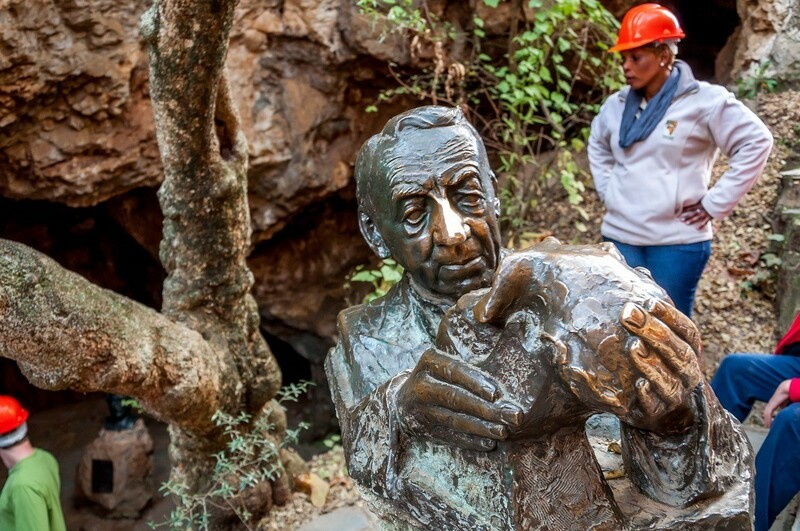 The Sterkfontein Caves are also open daily from 9:00am – 5:00pm. The last cave tour departs at 4:00pm. The Sterkfontein Caves tours depart every 30 minutes (twice per hour) every day. 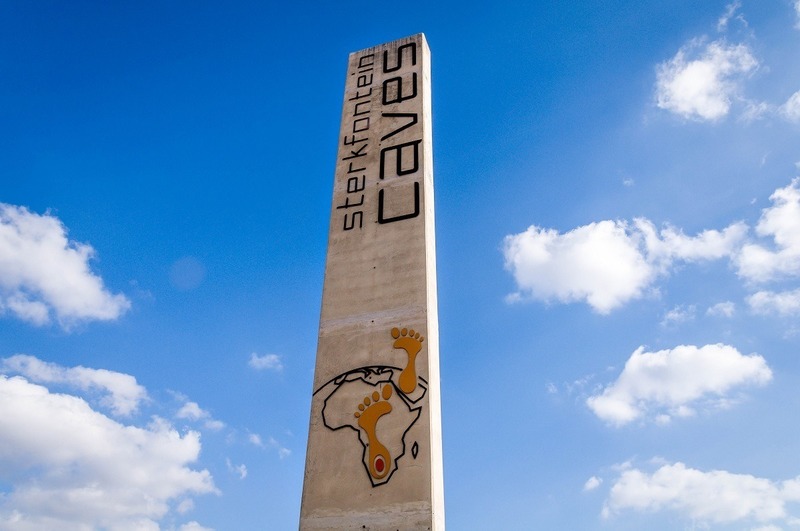 Please note: As the Sterkfontein Caves is still an active archeological site, it is possible to experience periodic closures, although such situations are very rare. 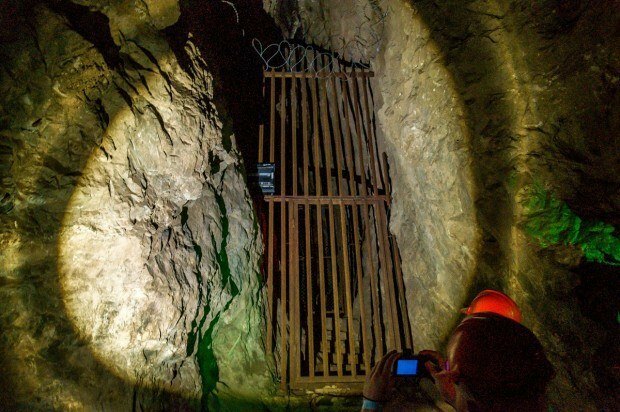 More details on Maropeng and the Sterkfontein Caves can be found on the official website. The mail telephone number is: +27 (0)14 577 9000. There are a number of Cradle of Humankind accommodation choices, both within the area as well as closer to Johannesburg. Check current prices with at Cradle of Humankind hotels here. 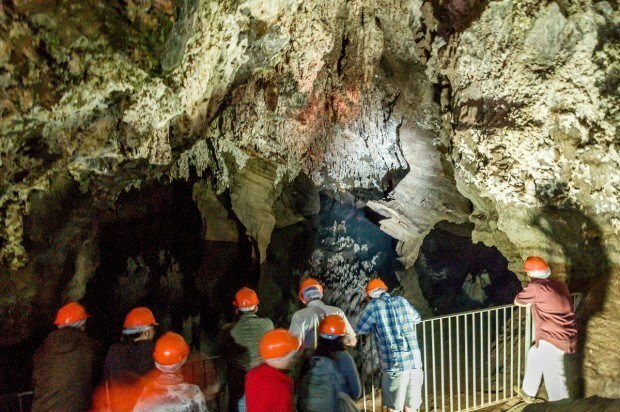 While there are number of accommodations in the Cradle of Humankind, we wanted something that would be close enough to explore the Sterkfontein Caves and the UNESCO site, but would still be close enough to Johannesburg to see some of the city. So, while planning our visit to South Africa to explore the cradle of civilization, we discovered the Morrells Boutique Estate in the Northcliff section of Johannesburg. We immediately fell in love and can see why it is frequently cited as one of the best hotels in Johannesburg! 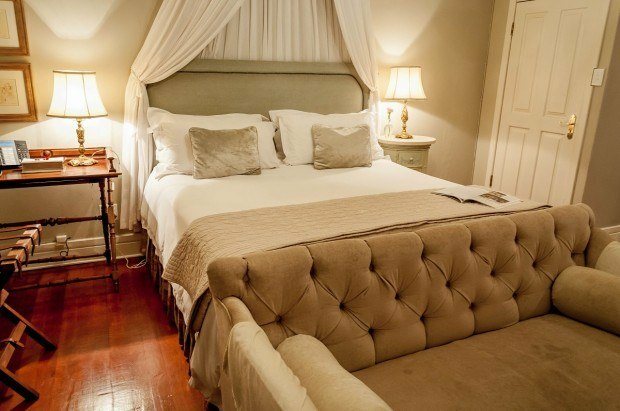 The Morrells boutique hotel became our home away from home during our brief stay in Johannesburg. The hotel’s location in the Northcliff section (on the west side of town), made it ideal for exploring the Cradle of Humankind, while keep us close enough to Joburg (as the locals call it) to see some of the city. 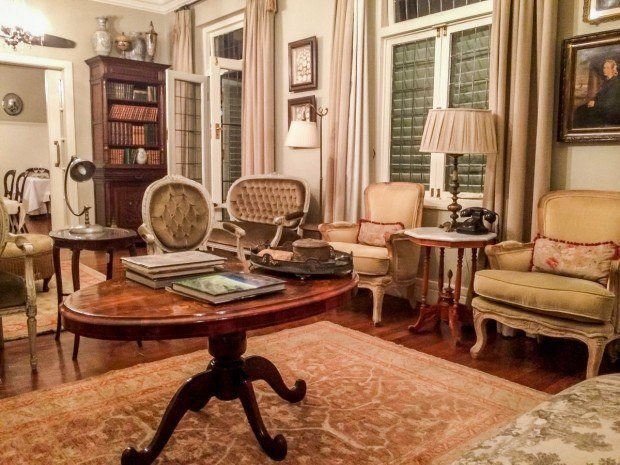 The Morrells Boutique Estate is ripped from the pages of French Country Style magazine. The hotel is decorated in bold hardwoods native to Africa, but designed in a French style. The fabrics and borders feature soft flower prints and springs of lavender rested gently in a vase by the bed. We stayed in Room 1 (The Figaro Suite) in the Morrells Manor House, which they consider to be their honeymoon suite because it is the largest and most romantic of their rooms. We were able to peek into a few of the other rooms, which were all individually themed or decorated (the Gardenia and Rosa would also be good choices). Unfortunately, we didn’t have the chance to see the historic Morrells Farmhouse just across the road, which was the first home built in the Northcliff section of Johannesburg. The intimate dining room at the Morrells Boutique Estate Manor House serves delicious food from seasonal ingredients in a cozy atmosphere. For dinner, we selected a bottle of Viognier wine from Creation Winery knowing we would be visiting that winery the following week. For dinner, we had their signature mushroom soup followed by a baby chicken in a sweet, brown sugar reduction. Dessert was a very contemporary twist on the red velvet cake. Our brief stay at the Morrells Boutique Estate came as a welcome end to nearly 48 hours of travel from the United States. Behind the high walls and amid the lush gardens, the Morrells Boutique Estate felt like an oasis in the vast urban landscape that is Johannesburg. Morrells is the kind of sanctuary where you just want to curl up and lounge in the tranquility while enjoying one of the best luxury hotels in Johannesburg. What do you think about Defining Humanity at the Cradle of Humankind? Looks like a cool place. We will have to check it out when we are in the area.